Who: Leïla Slimani is a Franco-Moroccan writer and journalist. Lullaby, or Chanson douce in the original French, is her second novel. In 2016, Chanson douce was awarded the Prix Goncourt. The story is based on the 2012 killings of the Krim siblings in New York. Lullaby was translated into English by Sam Taylor. What: The cover of the book tells all: the baby is dead; it only took a few seconds. A grisly opening awaits on the first page. A mother has returned to her apartment. She finds her children dead and the nanny bleeding out from a self-inflicted wound. It is a parent’s worst nightmare. The story then turns to parents Myriam and Paul Massè’s decision to hire a nanny. Myriam, a promising lawyer, had put her career on hold to be a full-time mother to Maya and Adam. But the joys of motherhood had soured to resentment over the years, and when an opportunity to resume her role as a legal eagle emerged, she made the difficult but perfectly understandable decision to put her children under care. Enter Louise, an experienced nanny with with superb references and an almost preternatural ability to be helpful. She immediately becomes an indispensable member of the family going so far as to join them on their family vacations. But it quickly becomes apparent that Louise, for all her benevolence and proficiency with the children, is not the heaven-sent angel everyone assumes her to be. Why: Slimani’s Lullaby is not a whodunnit, but a why-she-gone-and-done-it. Neither is it a work of redemption, but a visceral attempt at tying together seemingly disparate themes to provide an explanation. The prose in the book is explosive and Sam Taylor’s translation greatly heightens the fraught tension in the book. Slimani’s dispassionate and clinical observations throughout — it is evident she has done some journalistic work — intensifies the atmospheric feelings of horror and foreshadowing: Yes, the reader is always waiting for the other (nanny’s) shoe to drop. And because we know she’d gone and done it from the beginning, every action, no matter how innocent, is tinged with murderous intent (or perhaps they were never innocent to begin with). There are few surprises in this story, but Slimani nevertheless manages to create a compelling page-turner. Louise, despite her stabby madness, does elicit alternate feelings of sympathy and horror as more of her history is revealed. 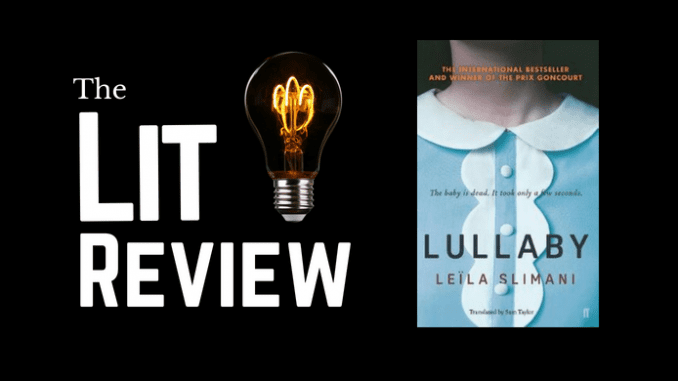 Lullaby, properly, is her story, her descent into madness and her devolution into a properly mechanistic creature who has lost the last vestiges of humanity. Nevertheless there is a niggling sense that Slimani begs the question somewhat, and this may have to do with the “inverted-pyramid” reporting style of the book. The book opens with the headline — the “big news”: The children are dead and the nanny grievously hurt from a self-inflicted wound. We then go back to answer the next question: How did it come to this? Myriam and Paul are modern, conscientious parents, and have been more than considerate and generous to the nanny. We conclude, early on, that Louise must either be comic-book evil or insane. But since this is not a comic book, we are really left with only insanity as the only explanation for her actions. Interestingly, this is not what the court concluded in the real-life Krim siblings case with their murderer-nanny Yoselyn Ortega deemed fit to stand trial (we never get to the trial phase in Slimani’s book so it may very well be the case that she receives the same judgement). Indeed, in the Ortega case, the judge, in pronouncing her sentence, described her as “pure evil”, thereby eliminating the latter fork of the evil/mad characterisation. It’s by no means a vicious argument to say that a caregiver who murders her wards on the basis of unjustified beliefs is mad or evil, and we could say that Lullaby is really about the particular flavour of Louise’s articulation. It doesn’t take away from the Slimani’s accomplishments to say that we know off the bat that Louise must be mad or crazy or worse. But given the slippery nature of madness, perhaps I was looking for something for a bit more to explain the stabbiness.